Fast mail coaches were introduced in 1784, with recognized mail routes springing up across the land soon after. 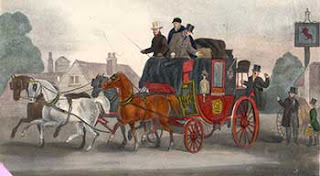 There were two types of fast coach upon the road and with the exception of the wealthy, who travelled in their own carriage or by post-chaise, and of the very poor, who used wagons or slow night coaches, all passenger traffic was done by Mail or Stage coach. Stage and Mail coaches were alike in build, carrying four inside passengers and ten or twelve outsides. Mail bags were piled high on the roof, and luggage was carried in large receptacles called boots at either end of the vehicle. The box seat by the coachman, for which an extra fee was charged, was considered the most desirable and was frequently occupied by someone interested in horse flesh. Mail coaches, which were subsidized or owned by the Post Office, were painted uniformly, the lower part of the body being chocolate or mauve; the upper part as well as the fore and hind boots black; the wheels and under carriage a vivid scarlet. The Royal arms were emblazoned on the doors, the Royal cipher painted in gold upon the fore boot, with the number of the vehicle on the hind boot. The panels at each side of the window were embellished with various devices such as the badge of the Garter, the rose, shamrock or thistle. The departure of the Mails was one of the most exciting sights in London. On its outward journey each coach collected passengers from whatever inn the vehicle was horsed at, and then dashed round at 8 p.m. to St. Martin’s le Grand to collect the mail. Coaches were called by name to receive their bags and the crash of the lid of the boot locking down on the special mails was the signal for each coach to speed away. Fast Stage and Mail coaches made their journeys in about the same time. It took 5 hours to travel from London to Brighton, 2 more to Southampton, 17 hours to Exeter, 19 to Manchester and 21 to Liverpool. This worked out to an average speed of 10 miles an hour. The coaches, besides galloping against each other, were always running against the clock, for lateness was punished by heavy penalties and loss of credit. The half-thoroughbred horses were kept in peak condition and during their stage of seven or eight miles were worked at fever pitch. The steadier wheelers were meant to act as a check upon their leaders, but more often than not the driver gave the wheelers their heads and the whole team sped along at a gallop. In truly severe weather, the sufferings of the outside passengers was terrible. Once, when the Bath Mail changed horses at Chippenham one March morning, two of the outside passengers were found frozen to death, a third dying later. Postboys were frequently lifted out of their saddles near the point of death. 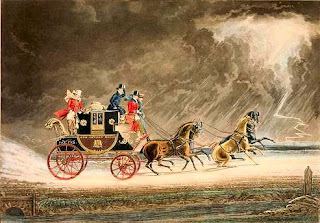 The winter of 1836 was one of the worst on record, with Christmas storms closing all coach roads for several days. On December 26th, the Manchester, Holyhead, Chester and Halifax Mails were all stuck in snow drifts at Hockley Hill, near Dunstable, within a few yards of one another, and throughout the country stories of overturned coaches and dogged heroism on the part of coachmen and guards were recounted. In one instance a guard, leaving his snow bound coach, carried out instructions by taking the mails forward on horseback. Nine miles farther on he sent the horse back, but pushed on himself. Next morning he was found dead, a mile or two up the road, with the mail bag still tied round his neck. Change of horses at each fresh stage was made quickly. Hostlers and stable boys were allowed a minute in which take out the old horses and harness up a fresh team, though some could manage the job in 50 seconds. Seats on a coach had to be secured in advance at the inn from which it started or where it stopped on the road. 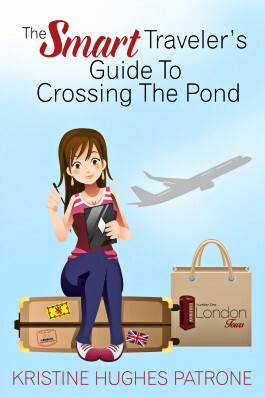 The traveller’s name was entered into a book and half the fare taken as a deposit. The fares by stage coach worked out to 2 1/2 to 3d a mile outside, 4-5d a mile for inside passengers. Mails coaches were dearer, averaging from 4 1/2d to 5d for outsides, 8-10d for insides. The coachman wore beneath his coat a crimson travelling shawl, topped by a long waistcoat of a striped pattern and over that, a wide skirted green coat, ornamented with large brass buttons. Usually he wore on his head a wide brimmed, low crowned brown hat. He wore knee cord breeches, painted top boots and a copper watch chain. The real responsibility for the coach rested with the guard who, in the case of Mail coaches, had the added care of guarding the letter bags. In their red coats, with the gleaming brass horn at the ready, they collected fares from those who joined the coach on the road, saw that the schedule was kept to and were entrusted with the execution of commissions. In case of accident, the guard looked after the mails and the passengers, carrying the former by horse and arranging for a fresh coach for the latter if necessary. They were accustomed to journeys of up to 120 – 150 miles at a stretch and received about 10s a week in wages. Inside passengers were supposed to tip the guards 2s 6d, the outsides 2s, and the guard collected further tips for handling luggage or running errands. Travelling post chaise was decidedly the favoured means. The chaise was a light and comfortable vehicle with two, or more commonly four wheels, drawn by two or four horses ridden by postboys. For great haste, four horses with two postilions were used. As with a Mail coach, the horses were changed at stages. There was room for only two passengers in a post-chaise, but most carriages had a dickey, or platform, at back for a groom. Principal turnpike gates out of London were found in Knightsbridge at the corner of Gloucester Road, in Kensington at the corner of Earls Court Road, at Marble Arch, Notting Hill, King’s Cross, City Road near Old Street, Shoreditch, Commercial Road, Kennington Gate and three more in the Old Kent Road. with her “Tally Ho!” to Birmingham. She also built coaches for sale at 110 – 120 guineas each. The Tally Ho! 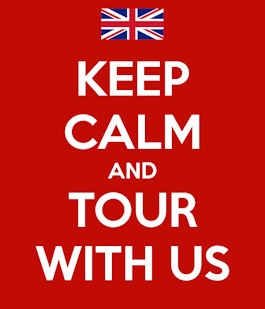 served Canterbury, Liverpool and Birmingham, and was one of nine coaches on the London to Birmingham route. It’s team of four horses was changed at each of the ten stops made between London and Birmingham. The Tally Ho! normally made the 109 mile trip in eleven and a half hours, travelling at an average speed of 9.5 mph. During the famous London to Birmingham race which took place on May Day, 1830, the Tally Ho! made coaching history, setting a record by covering the route in seven and a half hours, travelling at an average speed of 14.5 mph. It should be noted that the coach carried no passengers during the race. 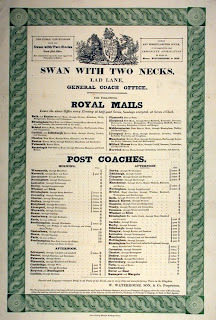 The Swan With Two Necks was the hub of much activity during the 17th and 18th centuries, serving London as a coaching, parcel and wagon office. The name is derived from Swan with Two Nicks, the nicks being the mark by which the birds of the Vintner’s Company were identified. The Inn was a terminus for northbound coaches and stood at the corner of Aldermanbury, where the Guildhall was and is located, with the Wax Chandler’s Hall being on the south side of the street. 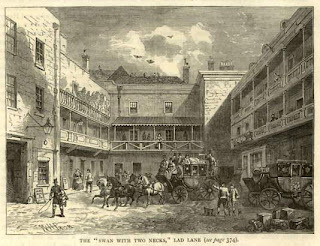 The Inn was demolished in 1845 when Lad Lane, St. Anne’s Lane, Maiden Lane and Cateaton Street were all widened during the building of Gresham Street. This is a marvelous post, ladies. Very helpful! I had a laughably frustrating moment while writing my latest book. 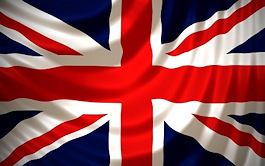 A tiny itty bitty detail about the English mails escaped me, and would not let me be until I'd hounded it down. The information I required? The cost of sending a single-sheet letter from Madras, India (a British territory), to London in 1818. Even more importantly, I needed to know what stamp or frank would be on that envelope. 🙂 I searched and searched on my own until I was obliged to apply to my university colleague, a specialist on British India. He pointed me toward a (nearly ancient) history of the British post in which I found information resembling what I needed. And after all that? Naturally… it never made it into the book! Oh, I love that print!!!!! Very impressive and also very interesting. Very kind regards. Previous Previous post: What a Reception! Next Next post: It's Criminal!